At the Cafe des Delices on the corner of the Rue Denoyez and the Rue Lemon, a man stands in the doorway and surveys the scene in front of him. How quickly things change he must think to himself as he draws on his cigarette. Today marks the beginning of another chapter for this street, the opening of the Piscine Alfred Nakache. The project of a piscine in the Rue Denoyez* had certainly raised a few eyebrows when it was first mentioned! It will surely bring many more people to this passageway that has now become one of the most photographed in the city. A few short years ago nobody walked around here. The shop units were locked up and shuttered down and the street was little more than a thoroughfare of crumbling walls and broken windows. These were the walls that saw another era though (c.1830), a time when this was a passage just outside the old city limits where people came to drink and dance. Mr Denoyez owned a tavern here, just alongside another famous venue, the Ramponeau caberet. 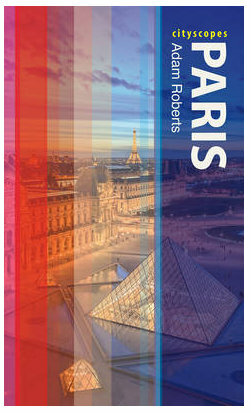 Whilst Paris struggled under high taxation, low prices here ensured that the venues were always full. The new swimming pool behind the Cafe des Delices. In recent times though this had become very much a street in decline. 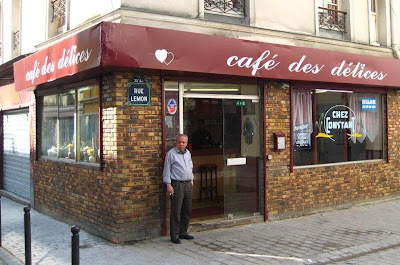 The Cafe des Delices was one of the only fountains of life, a place where Jewish Tunisian men have long gathered to drink coffee, play cards, or watch football matches on a flickering television screen. Alongside, no star hotels with rooms rented out on long term deals to families with no other options and shop units offering low cost long distance telephone lines. But then the artists started to arrive. One at first, a sculptor or painter perhaps, squatting a disused shop unit. Others followed and soon they were painting the units in bright colours and pasting shells and tiles on the walls outside. In the heart of Belleville this was nothing exceptional, but curious locals began passing down here again, stopping from time to time to look in the windows. 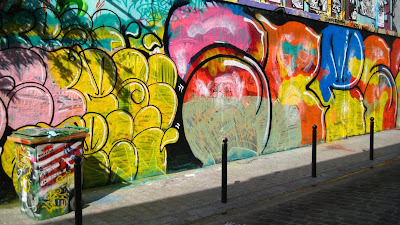 It wasn't until the grafitti artists arrived though that the street refound a name. Grouped around the Frichez Nous La Paix collective, a huge wall at the top of the street has been given over to these artists. 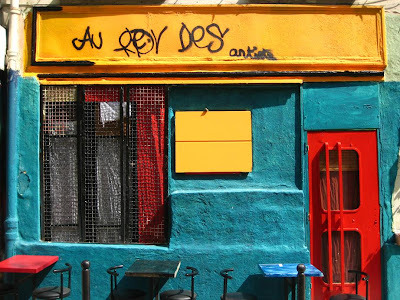 This wall is not just any wall though, but the side of the Aux Folies bar on the Rue de Belleville, a venue that has seen generations of artists visit the cafe and sun-trap terrace. The wall is a constantly evolving mural, with multi-coloured pictures and names now hundreds of sprayed layers deep. Even a tree, which has forced its way up through a crack, and dustbin find themselves incorporated into the creations. The street from this point up has now become a succession of brightly coloured facades, giving the illusion of a souk. It's lively and friendly, but as I take a photo of one unit a man appears and tells me to come and look inside. In truth they are a little tired of the procession of photographers, people who click but don't stop. "This is the real Belleville" he tells me, pointing out a scruffy, dimly-lit interior of exposed wooden beams. The establishment seems to be a clandestine café, sparsely furnished with second-hand chairs and tables and with plastic bottles of Coca-Cola on the counter. I'm not sure what he means by the real Belleville though. Clearly the building is old, but is this any more representative of the district than the Café des Delices opposite? 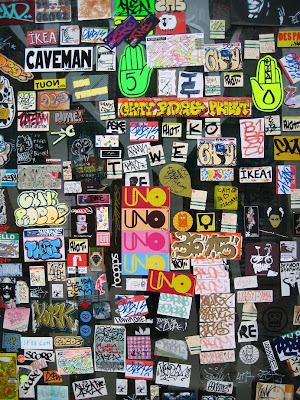 The Frichez Nous La Paix shop unit displays the tags of all the artists who have contributed to the wall opposite. In reality, this street has become all the Bellevilles. The Chinese community gather where it touches the Rue de Belleville, whilst African communities are centred more on the Ramponeau side of the street. Tunisians with both Jewish and Muslim ancestries have lived side by side here for 50 years in a quiet and mutual respect whilst more recently young artists and middle-class families have moved in. The beauty of the warren of streets that make up this district, the modern blocks and ancient houses is that none of them can claim to be the real Belleville. *Denoyez sounds like 'the drowned' in French. A funny name for a street with a swimming pool! It is piquant, the idea of a reality under the layers of bright paint. Some one must have an interesting sense of humor to build the piscine there. Yes, I took several photos of this street about a year ago when I "covered" Belleville on my blog, attracted by the graffiti and the tags. The street has again changed its aspect, quickly! L'origine étymologique de "Desnoyez" est sûrement plutôt en rapport avec l'arbre, le noyer. Comme le nom Delaunay assez répandu vient de "aulne" et "aulnaie" l'endroit humide où ils poussent. 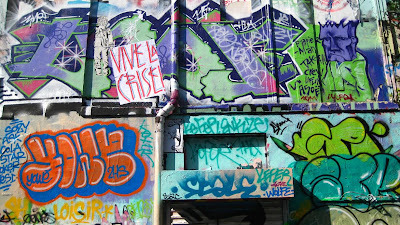 Belleville j'aime bien, j'ai quelques photos de tags (qu'on peut interpréter aussi) ou plutôt de fresques ou de boîtes au lettres d'artistes (rue Ramponneau). 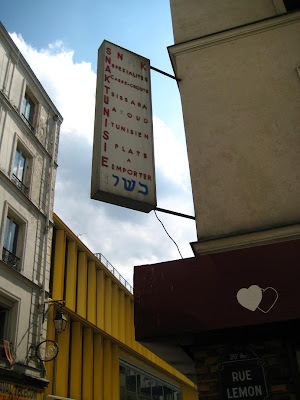 Des boutiques aussi. Dis moi, as tu entendu parler d'un appartement de deux pièces environs 38m2 à acheter dans ton coin ? what a perfectly colorful and intriguing post-- the brilliant reds and turquoise, the street art, picturing the Tunisian Jewish men with their coffee-- I enjoyed Martha's comment very much too. Thank you very much for the compliment. I keep a blog on my life on an island in the North Baltic off the coast of Estonia, if you are interested. Is it also spelled Dénoyez because I couldn't find Desnoyez in my Paris Commode, but I found rue Lemon? All that colour in the sunshine does make l'art de vivre very apt! Ah Gina you are right! It is Denoyez! I've made all the changes to the article now and I'm not sure how that one slipped through. I need an editor! ps. I was going for a Smiley Lewis reference with Blue Monday, but youtube didn't have it-- (Big Mamou is there tho if you have the time) New Order -far more popular than Smiley. I'm spending the morning listening to new order and reading about the history of Belleville here and there. Instant gratification thanks to the laptop and wifi. Thank you for your linking to ParisPointGriset. Love it! Thank you for this post!